Underground septic tanks and above ground septic tanks are available for residential, agricultural, commercial, and job site applications. Underground septic tanks are available in 200 gallon to 5025 gallon capacities. Above ground septic tanks are available from 250 gallons to 440 gallons. All septic tanks are rotationally molded of high density polyethylene (HDPE) resin, providing a seamless and durable septic tank that is resistant to corrosion, rust, impact, and punctures. Polyethylene septic tanks are resistant to the chemicals or gases that may be found in soil or sewage. These tanks are manufactured with UV inhibitors to prevent sunlight degradation for outdoor applications. Plastic septic tanks have characteristic resistance to fluctuating weather and temperatures, making them tolerant to environmental changes. These tanks are designated for waste water, sewage, and black water only. They are not FDA certified for potable water use. Septic tanks are the core unit of complete septic systems and the features of HDPE septic tanks provide long tank service lives. These septic tanks are state approved for homes, construction sites, trailers, cabins, RV parks, and for commercial and residential use in areas without municipal sewer lines. Underground septic tanks are also known as cesspits, cesspool tanks, below ground tanks, sewer tanks, sewage tanks, waste holding tanks, and blackwater tanks. Underground septic tanks are designed for underground burial or as a component of man-made septic system mounds. Protank’s septic tanks are manufactured to be durable and to allow quick installation. HDPE septic tanks are more lightweight and install easier than concrete and fiberglass tanks. They are available in unplumbed or in pre-plumbed installation ready options. Standard or heavy duty ribbed models are provided. They are offered as single compartment or multiple compartment tanks. Single compartment pump tanks are also available and in capacities from 200 gallons to 500 gallons. Inlets and outlets can be added to pump tanks on request. Septic tanks come fitted with lids. Manway extensions and risers can be added to all Protank’s underground septic tanks. 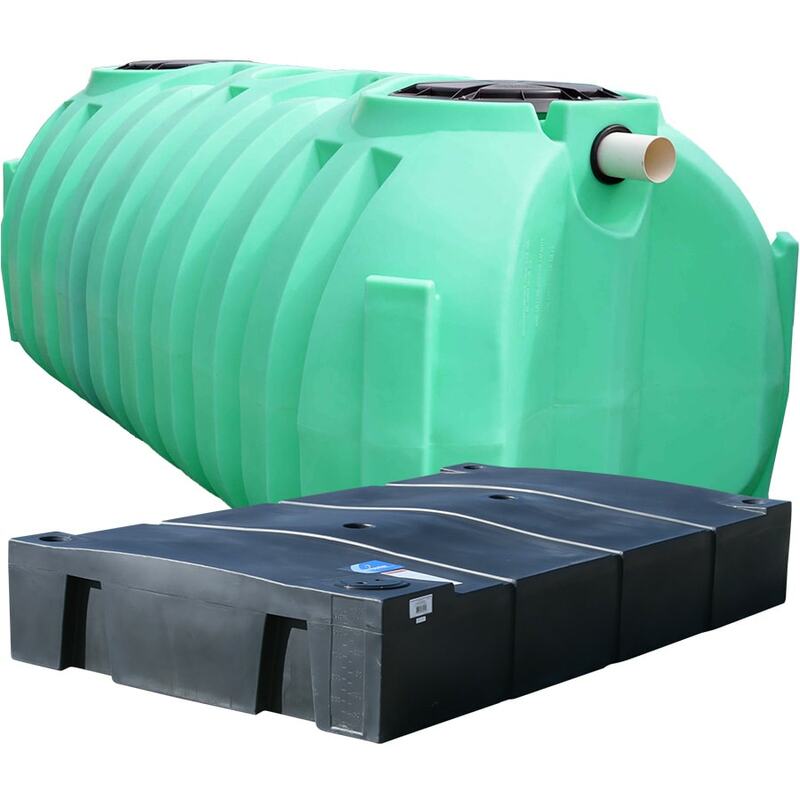 Above ground septic tanks are portable black water tanks also known as waste tanks, septic holding tanks, trailer septic tanks, job site waste tanks, shack tanks, camper septic tanks, motorhome septic tanks, and cottage septic tanks. Above ground septic tanks are designed to be freestanding with a low profile, rectangular flat shape for fitting beneath structures. They are also designed to receive various plumbing configurations through rubber couplers and recessed port clamps. Plastic above ground septic tanks are lightweight to allow two-person maneuverability. They are black or grey opaque in color. Pre-installed port options are available. Protank’s underground and aboveground septic tanks are provided with 3 year manufacturer warranties. Some customization options are available. Connections, openings, lids, inlets, and outlets are examples of custom fabrication options. Contact us for polyethylene septic tank questions, custom fabrication, of for further information.